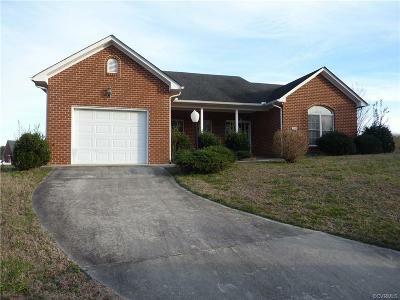 ALL BRICK HOME WITH POTENTIAL, PRICED BELOW ASSESSMENT. 2 BEDROOMS, 2 FULL BATHROOMS,LARGE LIVING ROOM. TILE FOYER, GAS FIREPLACE, TWO GLASS SLIDERS LEADING ONTO 22X13 SCREENED IN PORCH. CUL-DE-SAC LOT WITH LARGE PRIVATE REAR YARD. MASTER BEDROOM HAS DOUBLE WALK-IN CLOSETS/ BATHROOM HAS DOUBLE SINKS/LARGE SHOWER. SECOND BEDROOM ON FRONT OF HOME FOR PRIVACY. ONE CAR GARGE / NICE SIZE WALK THRU LAUNDRY AREA. COBBLESTONE IS A AGE RESTRICTED COMMUNITY. Directions: Cedar Level Road To Entrance To Cobblestone. Turn Right Beside Clubhouse On Mill Stone Drive To Cobblestone Drive. Take A Right Onto Cobblestone And House Is At The End Of Cul-De-Sac.